In winter all I do is put on my ripped denim, throw on a big sweater or a oversized coat, put on boots and I am good to go. 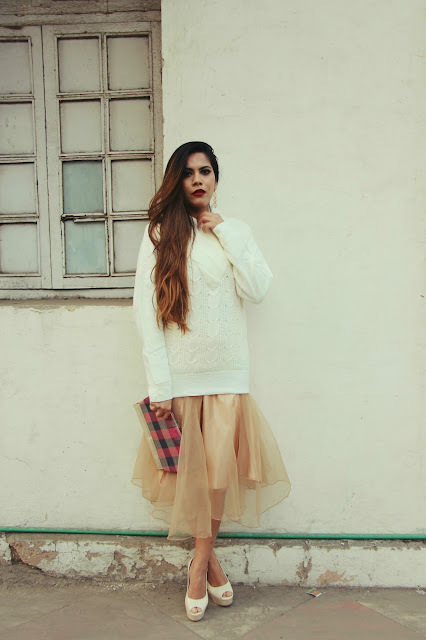 But this day I decided to switch things up ,paired a fluffy skirt and sweater together. Clearly it's a Deepika Padukone inspired outfit. Ok,so I will start by saying that winter is a lazy season for me, I go into my bed and try my best to not leave the house. The days that I really have to go out, comfort is the key, jeans and comfy pullover is my uniform for such days. But I tried to do something different and paired my FashionMia Cream pullover with this big poofy skirt that you first saw in Princess Tutu Skirt . Can you believe this pullover was just for $3 !! 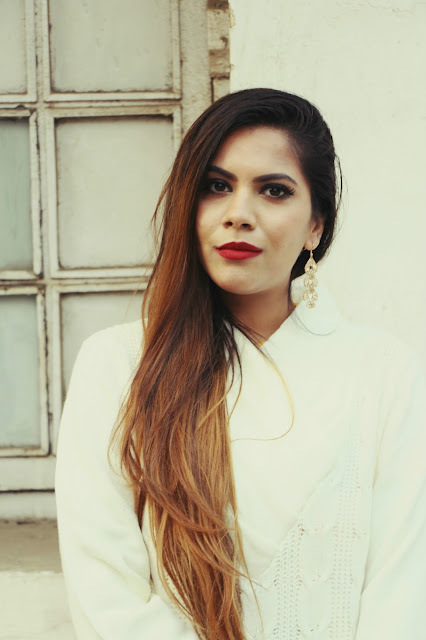 check out Fashionmia for such deals ! To go with it is my beautiful plaid Designerd Clutch and some gold danglers. When I got this braided pattern, I was thing of just throwing it over a skinny jeans but I think I quite like it this way. A few days back I saw a pic of Deepika Padukone , she was rocking a skirt with a long sweater over it and she was looking so pretty. Never thought that combo would look good but it did. I had to give it a shot,clearly I am not looking anything close but I am surly going to milk the trend this winter. I suppose now I know what to wear to a fancy day time get together, its a perfect Winter Day Glam outfit. 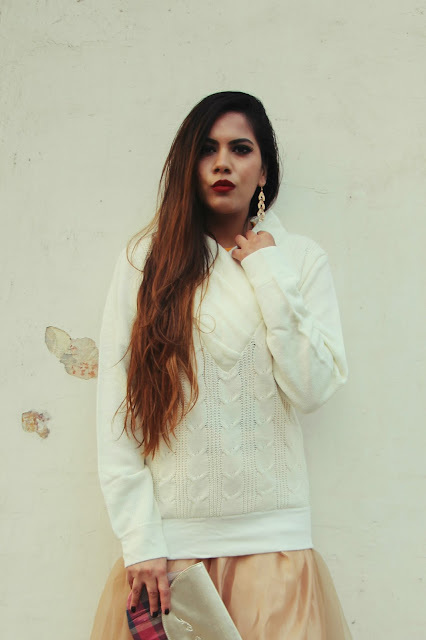 It's the best of both worlds, you can keep warm and still look well put together. 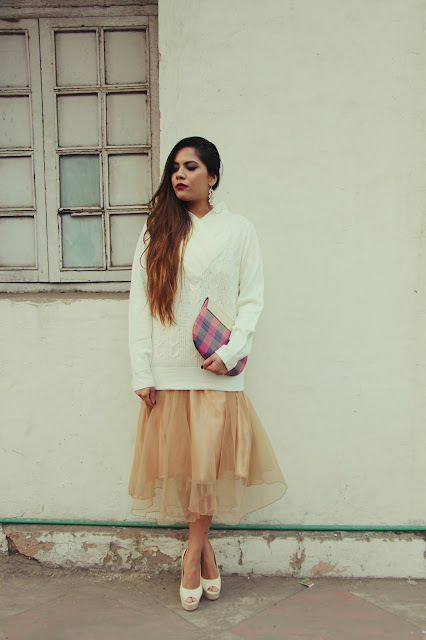 What do you think of pairing a long braid pattern sweater with a girly poofy skirt ! Such a girly and pretty look. Definitely unexpected for winter! Cool outfit, wud have loved to see the original outfit that inspired ur look. Cool idea to do the sweater and tulle skirt. 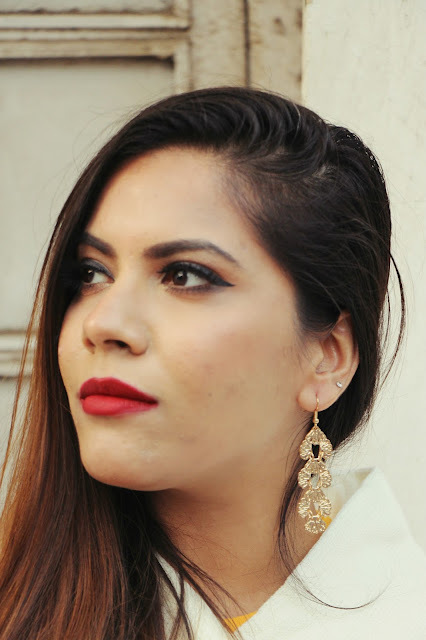 Love your earrings. Very nice outfit my dear. What a nice look! 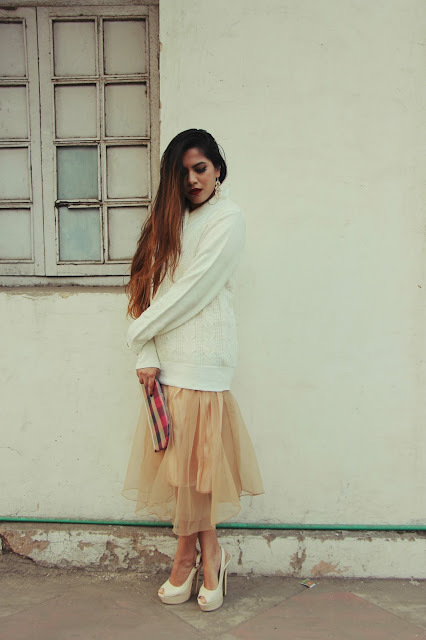 I love the oversized sweater and the combination with the festive skirt! Oh dear! I love this look! You look really amazing with this skirt!